The US Dollar is the reserve currency and just about everything (inside and outside the stock market) is priced based upon its current value. Almost all asset classes have a relationship with the dollar. Gold and oil are priced in US dollars. 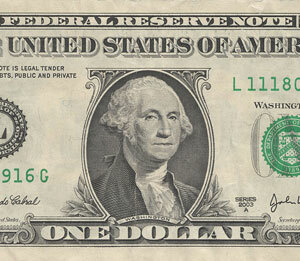 The currency of virtually every country in the world is priced based upon its relative value to the US dollar. I’ve also talked incessantly about “all the same market.” For the first time I know of, all asset classes are moving in tandem. It seems they are all going to turn at a top together. Even US treasury bonds are completely a trend and turning. We have a turn starting to take shape to the downside in the US Dollar. That’s the second to last turn (the penultimate turn) before a US market top. The turn at the bottom (below $23.00 on UUP, or 11,500 on the US Dollar chart, or $88.00 on the Dollar Index) will be the top of the US equities market. Above is a 7 day chart of UUP, the recognized US Dollar ETF that parallels the movement of the dollar. The patterns are virtually the same. The chart shows five impulsive waves up, with a second wave arguably in place once we get a test of the low. That’s the bigger picture. The larger trend is up. Let’s look at the shorter term. 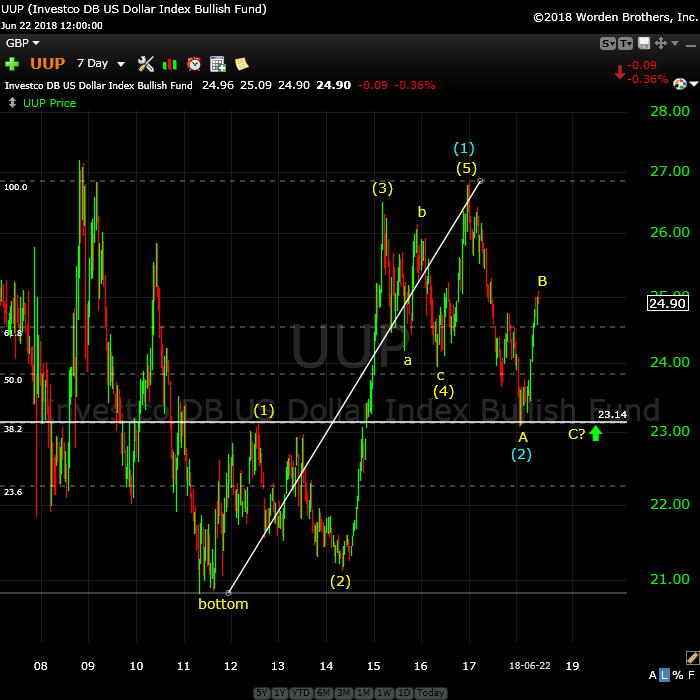 In the above chart, we have an A wave down to about $23.00 from the high just under $27.00 and a B wave up to ~$25.00. We now need a C wave down to test the previous low around $23.00. The horizontal line on the chart at 23.14 is at the 62% retracement level and makes the current corrective wave a second wave. This is predictive of a large third wave that will travel well above the $27.00 level. If the US Dollar rises, it’s deflationary. When goes up in value, it means it’s scarce (there’s no enough money in the economy to satisfy demand). In other words, credit is drying up; debt is beginning to disappear. Under our current international banking system, debt that is repaid simply disappears. For an explanation of how banks work, you can read my blog post on it here. As I’ve been saying for several years now, we’re heading into a deflationary spiral. If you’re on the right side of the market and understand what this means to the value of money (and take advantage of it), you’re going to be just fine. Now that my technical issues have calmed down somewhat, I’m putting the final touches on a new version of my webinar, “Navigating the Crash,” along with a second webinar, entitled, “The New Rules of Investing in an Uncertain Economy.” More info to come this week on both of these. In the meantime, US indices are in ending diagonals — SP500, ES NDX, NQ, Nasdaq Comp, Russell 2000, and Russell 3000. Ending diagonals are ending waves. I consider them corrective. In a fourth wave position, which we’re in, they foreshadow an imminent trend change. That’s a hard rule that will NOT be broken. Right across the board, it’s clear: We’re in the final stages of this 500 year bull market. The US Dollar, as I’ve been saying for over two years now, will be the key to timing the top of the US market, and other markets around the world. The US Dollar is ultimately going to increase in value. That’s deflationary. So is contracting credit, which we’re seeing worldwide. 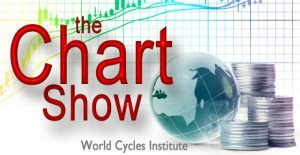 After all these markets top (or bottom, as the case may be), they will all move down together in what’s going to be the show of a lifetime. The drop in the eventual third wave (likely this fall) will be labelled “the crash” and it’s likely to be breathtaking in it severity. Motive waves contain five distinct waves that move the market forward in a trend. Counter trend waves are in 3 waves and simply correct the trend. These patterns move at what we call multiple degrees of trend (they are fractal, meaning there are smaller series of waves that move in the same patterns within the larger patterns). The keys to analyzing Elliott waves is being able to recognize the patterns and the degree of trend that you’re working within. The motive waves shown above are typical in terms of their look and length. Subwaves of motive waves measure out to specific lengths (fibonacci ratios) very accurately. Motive waves are the easiest waves to trade. Waves 1, 3, and 5 of a motive wave pattern each contain 5 motive subwaves. Waves 2 and 4 are countertrend waves and move in 3 waves. Motive waves also travel in channels. The red channel above can be drawn from the apexes of wave 1 and 3 on one side and waves 2 and 4 of the other. The end of wave 5 typically meets the trend line on the wave 1 & 3 side before it reverses. We wait, ready to pounce. The third wave of the ending diagonal is not yet complete. It's been a bit of a cat and mouse game. However, the mouse is really weak has been careful about showing itself. Starting this weekend, however, it may be on the move up to the target. Friday's market hardly moved except for the last half hour or so of the day. It seems it was all about a turn ... perhaps right across several asset classes. In the last half hour, ES gave us the signal it was going to start heading up in the final leg. However, we may see a little more downside before that move up happens. The subwaves are getting difficult to read. From Monday through Wednesday, we traced out an A wave in ES that simply looks corrective. Thursday, we traced out a deep B wave down and Thursday night, we completed a small 5 waver up. Friday late in the day, we completed the turn to the downside. Are we done with down? I don't know, but we should know my Monday morning. The early part of this coming week should see the final move up in the third wave of the ending diagonal. The target is still above about 2803 or so and will lead to a strong 4th wave down, which I've been saying for weeks now. This third wave has been one for the history books, and not in a good way. It's been frustrating to say the least. ES is extremely weak. The SPX/ES/SPY is the laggard, as the other US indices, for the most part, have hit their targets on the upside. This week should finally see the resolution, based on what I'm seeing this weekend. Summary: We continue to trace out the third wave of an ending diagonal. We're waiting for the third wave to top. Topping out will result in a high probability trade to the downside (the fourth wave of the ending diagonal). Once the 4th wave (down) is complete, expect a final fifth wave to a new high. That fifth wave up to a new high will be the end of the 500 year bull market. The dollar argument vis a vis the equities market is a bit confusing as you have presented it. If the dollar is indeed in an impulsive wave up, and I agree with that count, a new low, which would presumably signal a market top, would clearly invalidate an impulsive count. I guess I don’t quite ubderstand, based on your Dollar thesis, why you expect a market top at the start of the Dollar’s third wave up after a corrective second wave, as opposed to having topped at the low preceeding the first impulsive wave up. OK. I just realized was looking at a multi- year chart of the Dollar. Got it. I re-read it, removed a line that was redundant and cleaned up the copy a bit. Sorry. Yeah, it was a bit confusing as written. Thanks for the head’s up. We may see behaviors start to shift by (or shortly after) the full moon in Capricorn at the end of this week, June 27-29. That full moon is also conjunct Saturn (Sun/Saturn opposition), just a day after Mars turns retrograde. We already see a heavy Venus grand square in force, combined with a strong Neptune, stationary. To that, the cosmos will now add a heavy Saturn/Capricorn influence with a powerful Mars stationary. This brings to mind the pressure cooker reaching an extreme boiling point. Then this offensive dynamic gradually recedes, as the Moon begins to wane over the following two weeks, and Jupiter starts to assert his dominance. The mood probably becomes lighter, although there is a possibility that everything becomes even more exaggerated, and morphs into hysteria. I am thinking that we may get a break, and conscientious acts of kindness and efforts exhibiting goodwill may become noticeable. How will this affect financial markets? Well, any market making cycle lows into this period (June 20-27) is susceptible to bottoming and beginning rallies. This is not a time to panic. Let others do that if they so choose. This can be a favorable time to look for opportunities, new trends, which could continue into the Jupiter/Neptune and Saturn/Uranus trines of mid- to late August. The only wild card in the deck is Mars square Uranus, which lasts until mid-September and can still correspond with unexpected events and announcements that drive the markets (and investors) crazy, especially around August 1 +/- one week. Interesting and thought-provoking posts Joe Thanks. From an EW viewpoint,futures putting some pressure on the idea of a third wave ED zig zag. It already no longer has a three wave look and a move lower will exacerbate the disproportion.For the ED the third wave has to move above the wave one high and we really should see turn today if that pattern is going to play out. This decline is now really starting to look like a new downtrend which would imply completion oc the previous wave. Commer ials covered half their E mini shorts so I expected upward movement today. So far it looks like that might not hppen. I held my long vol positions and glad I did. The coming full moon could indeed bring a vol spike and i.terim market bottom. My Astro work is pointing for a low on Tues/wednesday this week. Closed SPY puts. I think /ES May 29 lows will hold. Tremendous technical damage being done to equities markets by today’s decline. The numerous overhead open gaps, and demolition of several S/R pivots is quite ominous imho. The last wave up is clearly history but I am not at all sure how to count the present decline. Triangles! Hate ’em. And yes, I am. It looks like we have a triangle in ES after all, rather than an ending diagonal, while the other indices have ending diagonals. Mixed bag. This is becoming interesting . The up coming full moon as well as the july 2 date. im following 2 separate cycles they blend but they do not match. my gut says keep bearish yet expect a reprieve . new moon high to new moon low is my key for the set up . not saying i want a july 13 high yet fits as an extension . july 27-mid august can be all over the place . I was thinking the same thing with E down underway. If correct, a sharp reversal is just ahead. For the triangle idea, we probably are completing just the A wave of the zig zag so a temporary bounce just ahead. The C wave down should sharp, short, and sweet! Full moon bottom may be on tap. The NQ ED is looking good. The third wave still looks to be shorter pointswise than wave one, and now wave four needs to similarly remain within the points distance traveled by wave two as well as travel into wave one territory. Then of course wave five has to remain within the points range of the third wave. Holy Moley! What an AWESOME potential set-up for the short trade of a trading lifetime! I am looking with great interest now at the A/C potential trendline for SPX. A sharp bounce in that area will in my opinion be the triggrer for deployment of the mother of all bull put spreads!!! That level looks to be around 2625…..
Just something to look at it. Seeking clarification, if there is any to have with this market. From your new moon high on June 13th you were looking for a new moon low on July 13th. However, an almost parallel cycle is influencing things to the point that July 13th could also be a “new moon high”, is that interpretation accurate? If so, what does that mean for your bearish view and the “new moon August 11th” date? Don’ feel compelled to offer up an opinion…I am confused with a bearish bias. Just seeking a little clarity. Bradley model turn date June 9 which was a saturday . Closing high June 11 which was the monday following. updated as of yesterdays close. Caution is warranted. JPM broke its Feb. 5 low and trading below 200sma. I have the ES 15 minute bumping up against a downward trend line at 12:30 (EDT), and see a 7/13/18 low based on a Mars/Uranus cycle. Shorting here with tight stop. Thank you for the updated “cycles” chart from earlier today! Well, you could count is as an impulse wave if you ignore the subwaves (many of which are overlapping), the fact that it doesn’t measure properly, and has an extra set of five waves at the top (which might be OK if you had a valid second wave after the first five waves … but you don’t). Just minor stuff like that. Why i think the low 23000’s are coming . Looks to me like a 3,3,5 correction off Monday’s lows. A move higher into Friday would result in a VERY large C wave imho…. I think the markets are at an inflection point. What I saw in the futures markets this morning strikes me as sheer panic on the part of central banks. Does anyone think this kind of price action is in any way remotely normal? Next bus stop Juli 3…. Which is roughly 1 month prior to the solar eclipse . Hence new moon high to new moon low . To add to this look at the late January high and the Feb low . Was around Feb 15 and the market bottomed Feb 9 ? Indicator wise the market is mildly oversold . Period I am most interested in . New moon solar eclipse low ) so which is it ? Past the solar eclipse to the full moon surrounding that time count . July 13 plus 6 weeks as well as Aug 11 plus 6 weeks . Seems to me like folk calling for bullish price action may want to revisit that prediction. This morning’s ramp had all the classic earmarks of a C wave. If you allow those to pull you in you are going to loose money. Looking foward to the Chart Show to get the inside scoop. I am not always successful in using EW to plan trades but there is at least a logical basis for its predictions, and always a number that says I am wrong. FWIW, I see a M/U low on July 13 (per Cowan) which fits nicely into your new moon high to solar eclipse low theory. we made a Low on 2695 and on 2695,25. perhaps the lowest LOW is done. Then the indicators are giving a high tomorrow and i Think close till the end of US trading. I think counter trend bounce is done. 1. Failure to hold contested 2720 pivot. 2. Long upper wick, almost shooting star candles. 4. Negtive divergences at morning highs. 5. RUT prints red on give-back of morning’s gains, and then some. I expected as much and shorted the pop. Just wanted to say thanks again to Joe and other astro guys who give REASONS for their projections. It is very difficult, if not impossible, to learn anything from, or even take seriously, posters who throw out assertions without any kind of support for what they are saying. Why bother? No offence. Their indicators might be proprietary. I check if it aligns with Peter T’s, Joe’s & my own projections/hypothesis and the usual indicators. You can’t learn from them but it’s a nice confirmation if it’s in synch with yours. I am a new poster here, but Verne, get over yourself! i find your reactions to certain posters whom you deem not to your liking haughty and unnecessary. We are muzzled enough in this world, not to be pettily and petulantly critiqued from within. I say post away comrades! There is no marginal cost apart from a mouse-flick. Besides, I don’t know anyone who consistently makes money in any market to fully reveal their reasons involving proprietary trading strategies.